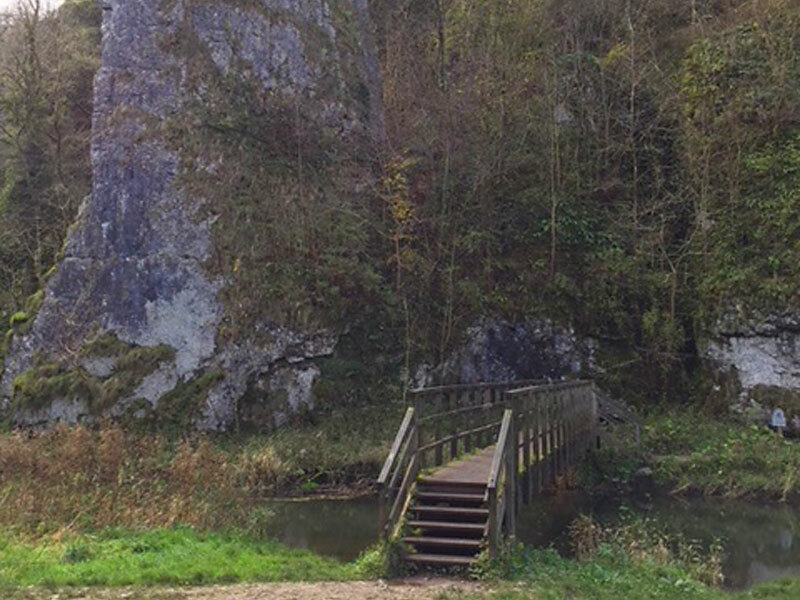 Step into a watery world with a taste of Dovedale from Thorpe village which includes the infamous Stepping Stones at the gateway to this renowned beauty spot. Thorpe Cloud dominates this beauty spot at the southern end of the Dale. The Cloud is named for the village of Thorpe, one of the few Peak District places whose name has a Norse origin. The name of this steep, conical hill means Thorpe Hill – the Cloud part of the name is derived from Old English ‘Clud’ which means hill. Coldwall Bridge is another point of interest along the Dove, part of an 18th century coach road to Cheadle. Rural idyll combined with iconic landscape and a historic trial. 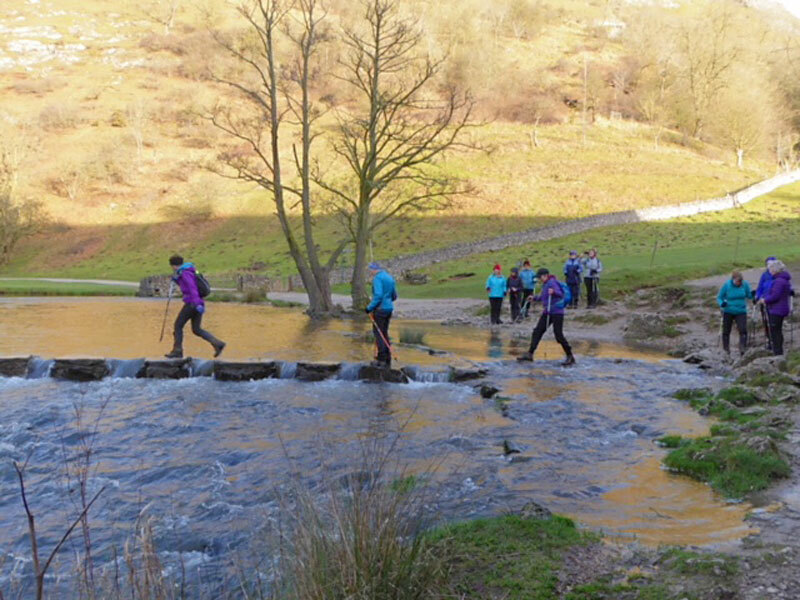 This walk scratches the surface to introduce you to the Peak District and Thorpe Cloud (without climbing it) which rises from the river Dove at Dovedale and reaches a height of 943ft. finishing along a good stretch of the trail and giving you a taste to explore more after this short walk. A Historical trail to the picturesque Market Town of Ashbourne which nestles on the edge of the Peak District National Park and is full of interest. Discover links with Shakespeare, Bonnie Prince Charlie and the world’s longest Inn sign as you walk along Roman Roads and through the ancient streets where Tub Thumpers (Barrel Makers) and Butchers plied their trades. A lovely walk through the small hamlet of Stanshope down quiet Hall Dale. With superb views of the River Dove before crossing the river from Staffordshire into Derbyshire and walking along the dale to picturesque Milldale crossing Viator’s Bridge, a packhorse bridge named after a character in the best-selling book The Compleat Angler. The walk is completed by a long steady climb up Millway Lane back to Alstonefield. Get a taste of village life before hitting the trail. 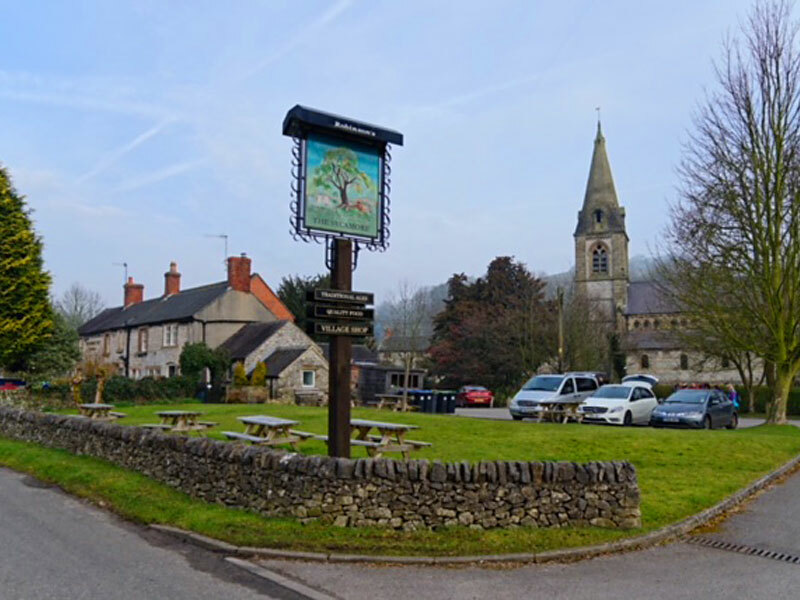 It is one of the prettiest and most unspoilt villages not only in Derbyshire but in the whole of the country featuring many quintessential shops and cottages. A mix of quiet lanes, tracks, field and the trail with views over the dales and surrounding villages. From one former railway station to another, taking in an easy southbound section of the trail leading to farmland and footpaths. 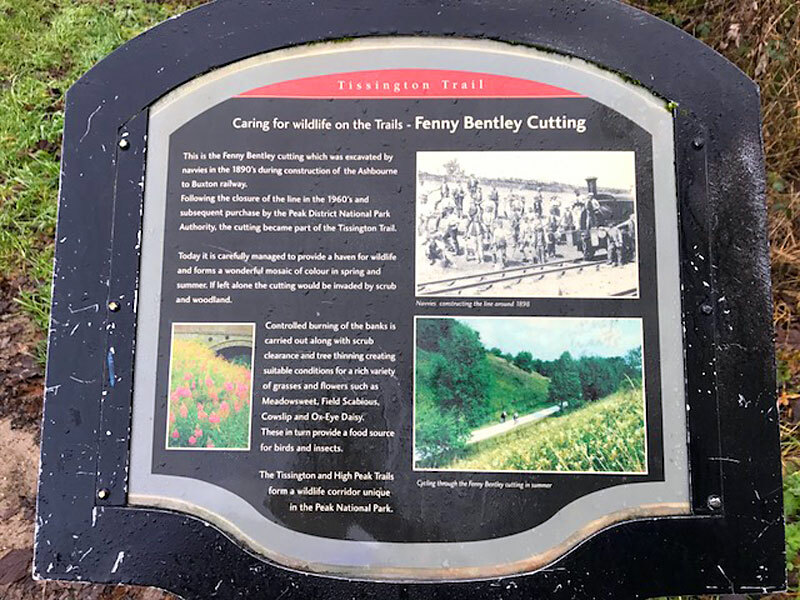 This historic trail was once the trackbed of the Buxton to Ashbourne railway line, built by the LNWR and opened in 1899. In its heyday, it carried express trains from Manchester to London and until after the Second World War a daily train delivered milk from Peak District farms to Finsbury Park, London. This walk crosses farmland, a nature reserve, a moated Manor house from the 15th Century known as Bentley Old Hall and is unique in Derbyshire with its square tower and defensive slit openings in the walls. The route then rises steadily through meadowland past Bassett Wood Farm where we will stop for a cream tea and then back to explore the picturesque village of Tissington. Charge of £3.50 for Cream Tea. This is a great more challenging walk through the most popular tourist attraction in the Peak District. 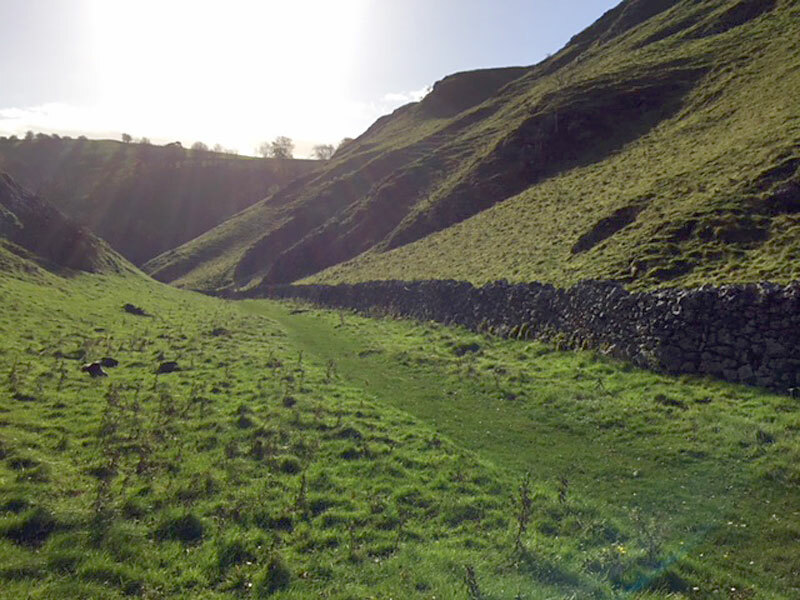 Dove Dale is one of, if not the most, beautiful limestone dale in Britain. 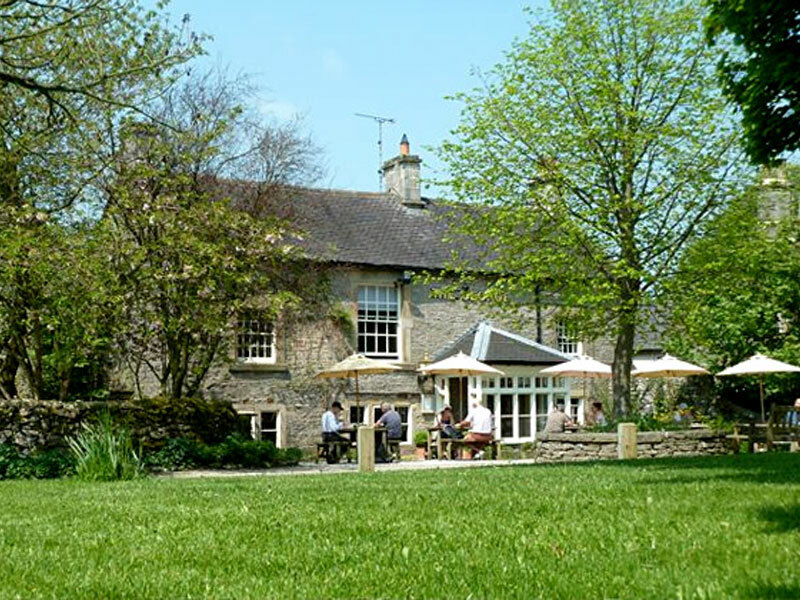 Dove Dale has a variety of scenery with the ever-changing River Dove, the steep limestone cliffs and spires, the rare woodlands species and at the half way point the quaint picturesque village of Milldale. 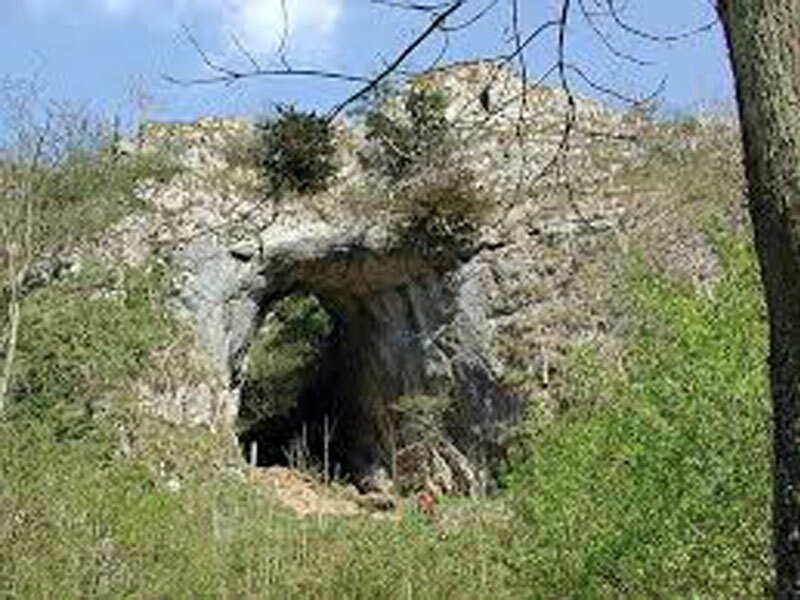 One of the most fascinating features of this walk is its many caves, Reynard’s Cave and Dove Holes are outstanding. 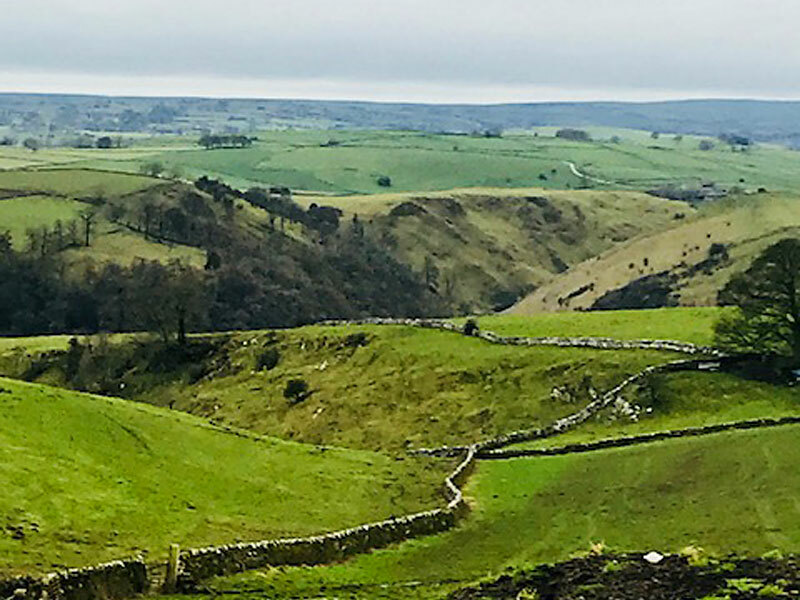 A circular walk from one traditional Derbyshire village to another starting in Tissington across fields to Parwich and along Eaton Dale to Alsop en le Dale. Walking in the scenery of the Peak District and enjoying the gently undulating hills. Parwich must rank as one of the most attractive villages in the southern part of the Peak District, but not being on the main route to anywhere, remains relatively undiscovered. Alsop, barely a hamlet, here you will discover the delightful little church of St Michael and All Angels and Alsop Hall. It is a magnificent building and not one you would expect in such a tiny place. It is the late 16th century former home of the Alsop family and in a minor way is reminiscent of Hardwick Hall in Chesterfield. 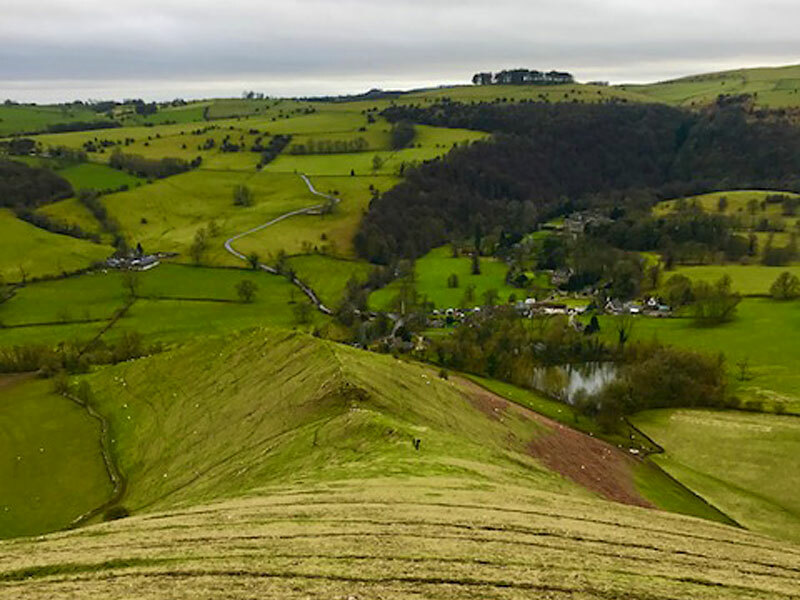 The beautiful country park at Ilam is an ideal starting point for this walk that takes you through some of the Peak District’s finest countryside. Passing the Izaak Walton Hotel to the edge of Dovedale reminding us of the famous angler of the same name, who together with Charles Cotton, wrote the bestselling book The Compleat Angler, and loved Dovedale so much. This is a delightful walk taking in the views of Dovedale from across the valley with a short level walk to start across the medieval St Bertrams bridge. You’ll easily see Thorpe Cloud, Bunster Hill and sections of the Manifold Valley from the highest viewpoint. A walk with an initial ascent rewards you with these views. A ruinous farm house awaits your visit which used to serve the estate and funds raised went towards supporting the village school. The small hamlet of Rushley and Paradise walk must be tempting enough to entice you onto this walk. 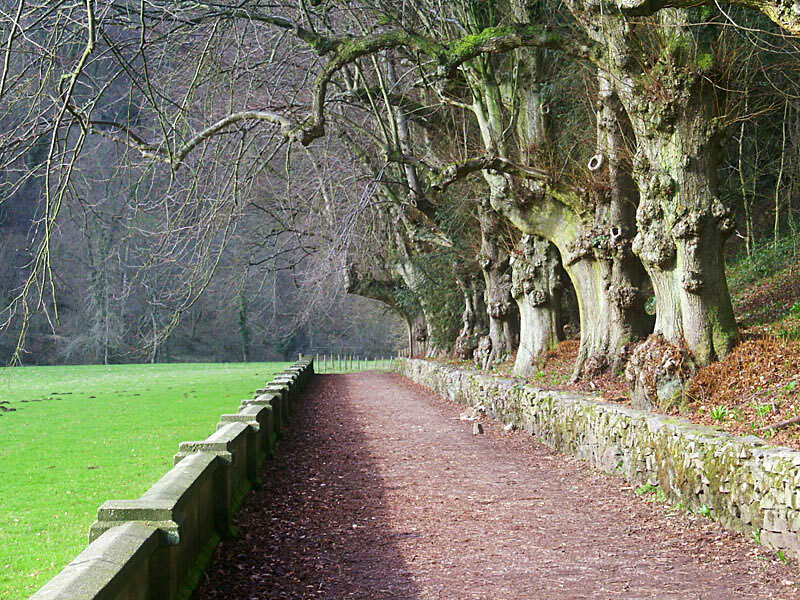 Paradise Walk was laid out in Victorian times as a carriage ride for visitors to the Hall through the Pleasure Grounds of Ilam. Ilam Hall, which is now a Youth Hostel and is not open to the public, was built between 1821-6 by Jesse Watts-Russell. It is on the site of an older hall, of which only the stable block now remains. The Italian gardens were restored in 2001 and are a wonderful place to take in the views across Ilam village towards the flat-topped Thorpe Cloud and Bunster Hill, which form the gateway to Dovedale. The woodlands here are Sites of Special Scientific Interest and are made up largely of lime, beech and ash trees. There is an abundance of wildlife, especially birds, all year round. Look out for water bubbling up into the river. These ‘boil holes’ are water from the River Manifold, which has traveled through caves from near Wetton Mill, four and a half miles to the north west! In the small railed grotto the River Hamps also emerges, having traveled underground from Waterhouses three miles to the west. We will be using this route for a Guided Walk with a National Trust Ranger and also for a Mindful Walk. 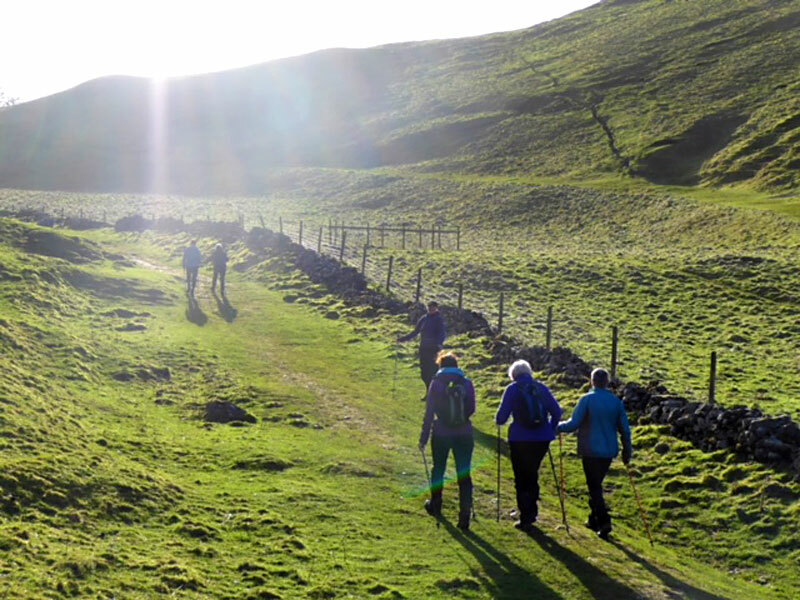 A special walk from your Derbyshire Host, Samantha Armstrong from Coreconcept Nordic Walking – this was her first ever Adventure Walk 10 years ago. 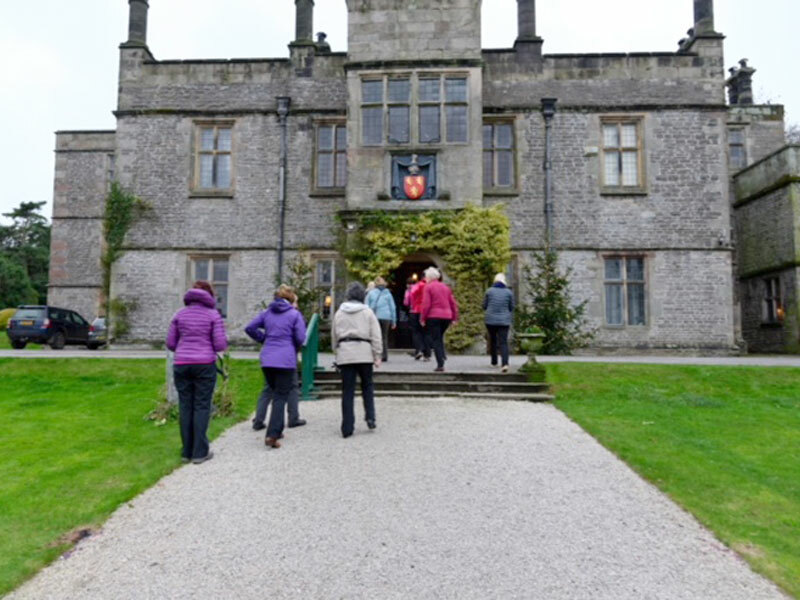 Following the same route from Ilam Hall along Paradise Walk which was laid out in Victorian times as a carriage ride for visitors to the Hall through the Pleasure Grounds of Ilam. Opening up to views across the Manifold and Dovedale Valley’s. Along to Bunster Hill where you ascent passing the sacred Well of St Bertram. A wonderful place to take in the views across Thorpe Cloud which forms the gateway to Dovedale. 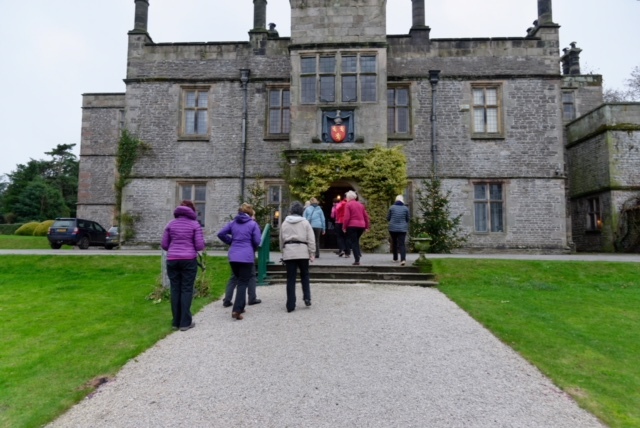 Soak up the history of Ilam and its medieval buildings at the end of the walk before enjoying a cuppa at the NT café or Izaak Walton Hotel. This walk will take you past some of the most prominent burial mounds in Derbyshire and a Grange, reputedly haunted by a murderous past. 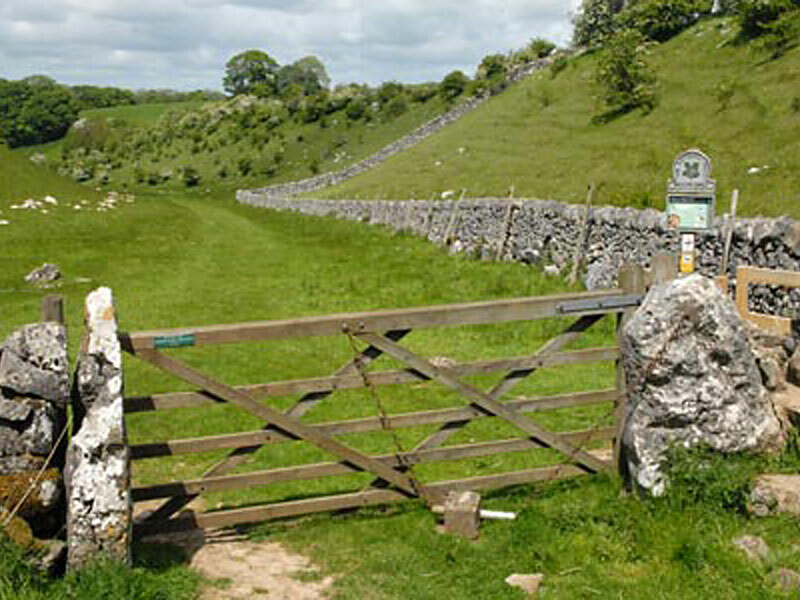 Starting the walk from Tissington, the trail is a feature to start, upon leaving there and joining Gag Lane which runs due south and is little used today. 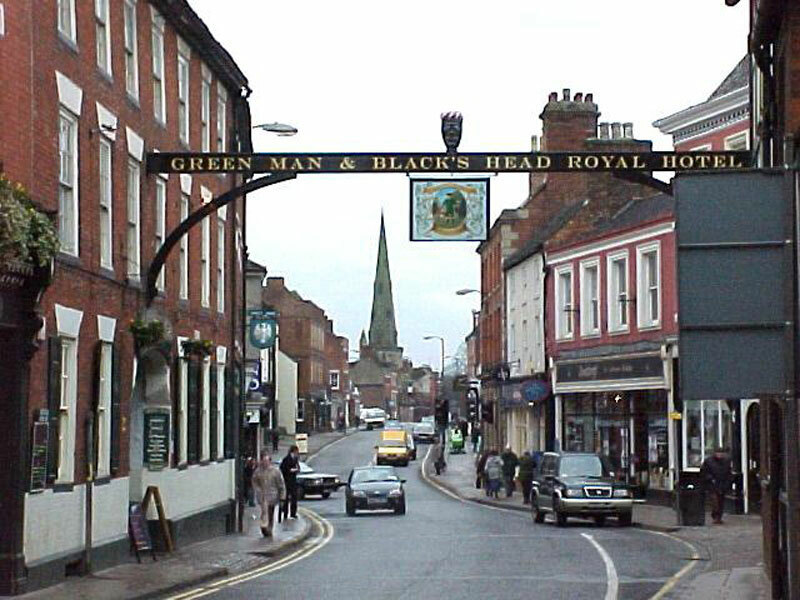 In the past it is likely to have been a main route from Ashbourne and in the 1760s was a turnpiked road. In earlier times it is likely that it ran north past Moat Low to Alstonefield crossing the River Dove at Viators Bridge and would have been recognised as an important communication route leading north. Plenty of history and magnificent views to soak up with this walk. 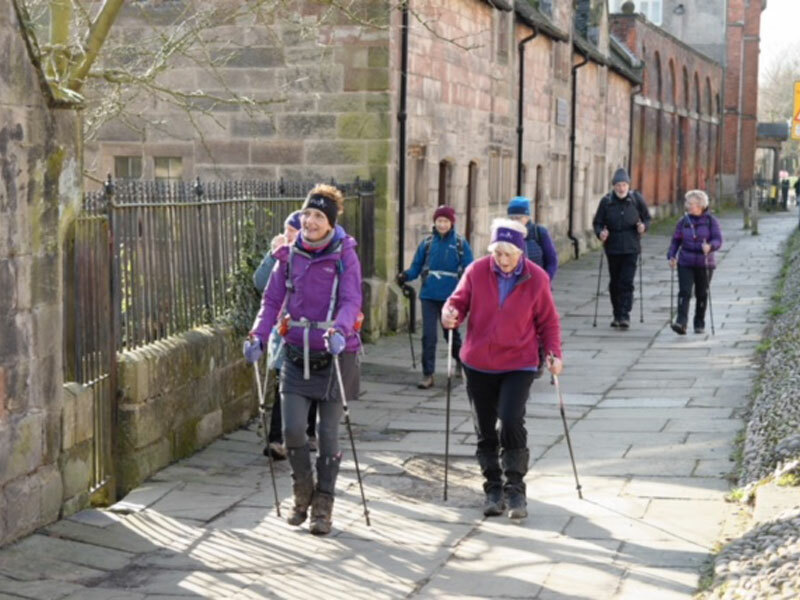 Join our experts in an Ultimate Nordic Walking session. This is a combination of our Ski Fit programme and Trek Fit combined linked in to a walk from Tissington. If you have never tried this out before now is a great opportunity. This is a delightful and varied walk from the pretty village of Wetton. Wetton is a small village of stone cottages standing high above Wetton Mill in the Manifold valley. Wetton has an inn and a part 14th century church which has an external staircase to its belfry. The route follows field paths to Alstonfield across undulating field paths lead to where there are wonderful views across the Staffordshire Peak District. This charming cafe awaits you, The Old School Tea Rooms is the perfect place for brunch or lunch on our return. The ultimate hill bagging challenge in this area. Walk two hills dipping in and out of Dovedale. Thorpe cloud rising from the river Dove at 942ft. Its distinctive conical shape viewed from Dovedale gives the hill a mountainous feel. On the opposite bank of Thorpe is a higher but less isolated and not as well-known Bunster Hill, standing at 1,079 ft, both hills were acquired by the National Trust in 1934 for the South Peak Estate. 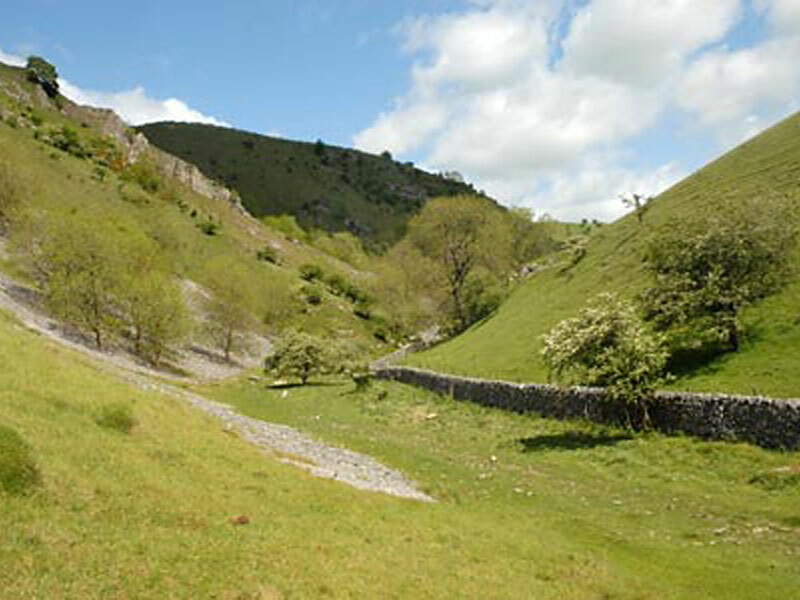 Little Switzerland is the name often given to this section of Dovedale and you can understand why. 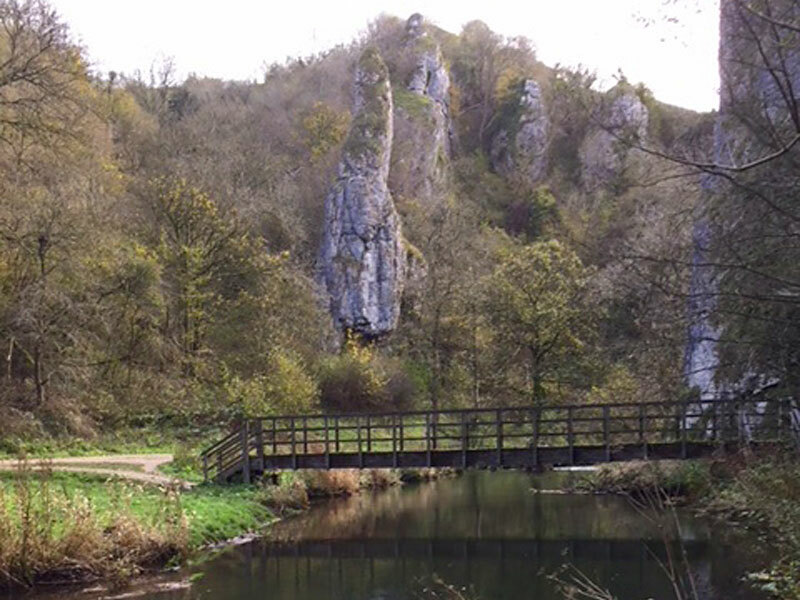 Dovedale was one of the locations used in the filming of the 2010 film Robin Hood staring Russell Crowe including scenes with Thorpe Cloud in the background. A delightful walk with magnificent scenery and the incomparable River Dove, what more can anyone want? Milldale is a delightfully positioned hamlet at the northern end of Dovedale. Here you’ll see the ancient packhorse bridge, over the River Dove, is the most famous of all in the Peak District. It is known as the Viator’s Bridge, and was made famous in the English classic The Compleat Angler by Izaak Walton. A lovely one and a quarter mile stroll along the banks of the River Dove is followed by a slow climb up through Hall Dale and continues along to the top of the valley to the small hamlet of Stanshope. 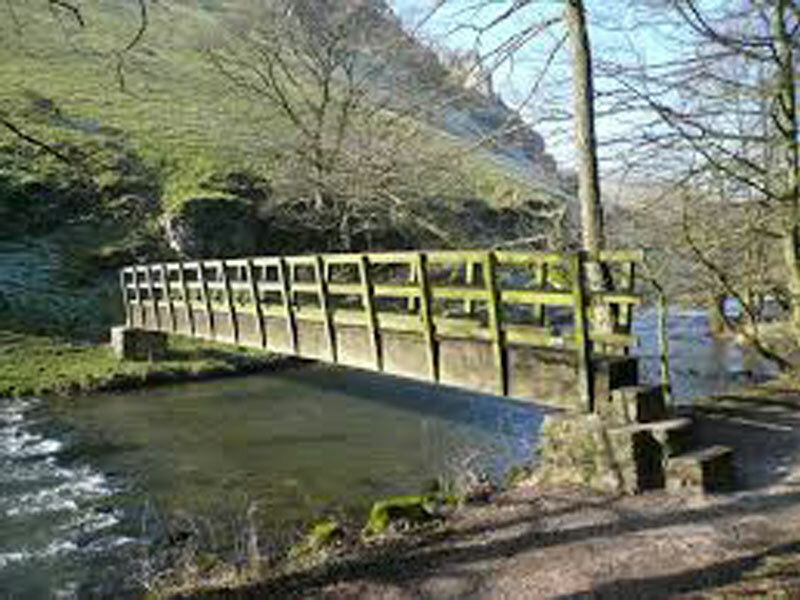 Dovedale is one of the most treasured beauty spots not only in the Peak District but also in the country. 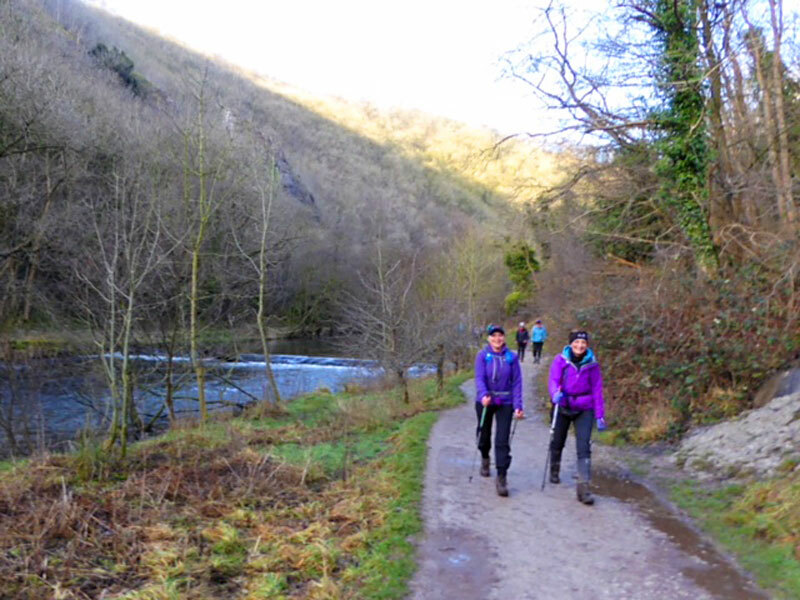 This walk is a short circular route to give you a taste of Dovedale and Milldale. 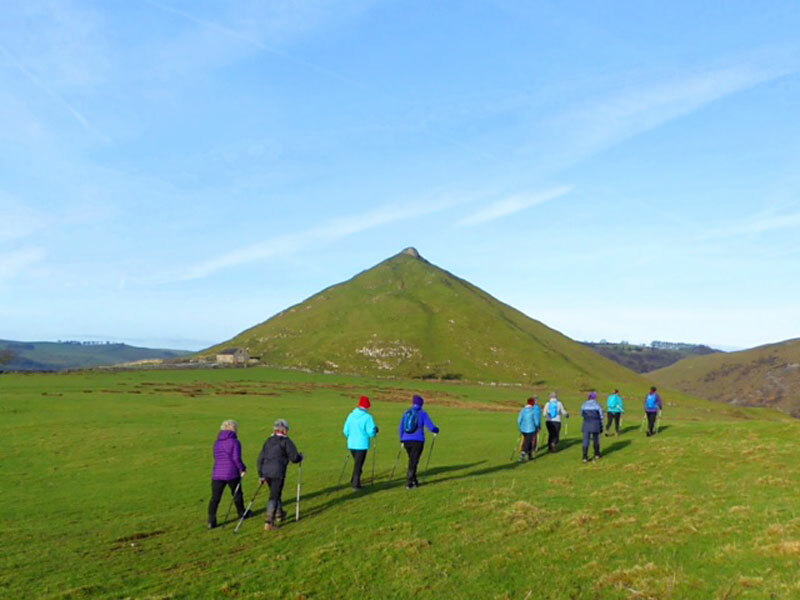 An opportunity to climb the conical shaped Thorpe Cloud, an impressive limestone hill that stands in isolation. It rises straight up from the River Dove guarding the entrance to Dovedale and reaches a height of 942ft. Its distinctive shape viewed gives the hill a mountainous feel. 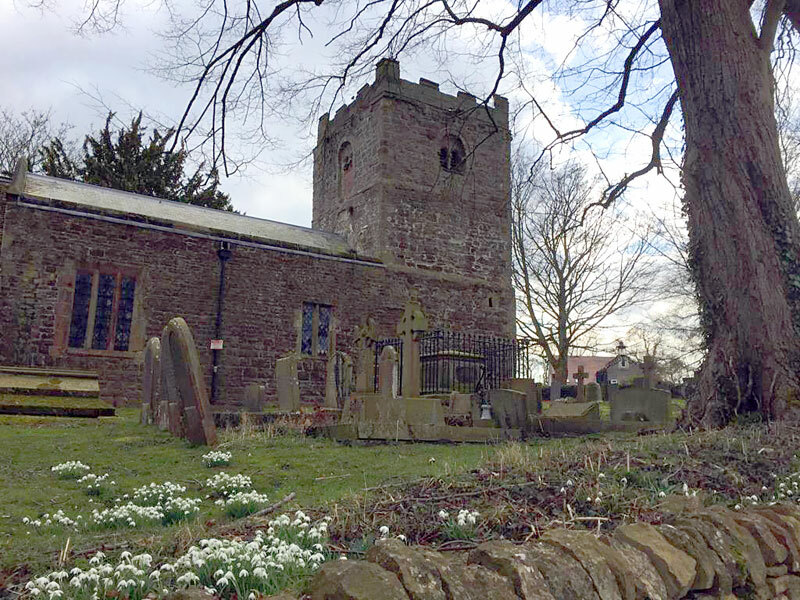 The walk also takes you around the picturesque village of Thorpe which passes its most interesting features, St Leonards Church with its square Norman tower and both the Tissington Trail and the Limestone Way. This short walk around the picturesque village of Thorpe passes its most interesting features, including the conical Thorpe Cloud, an impressive limestone hill that stands in isolation, St Leonards Church, the Tissington Trail and the Limestone Way. 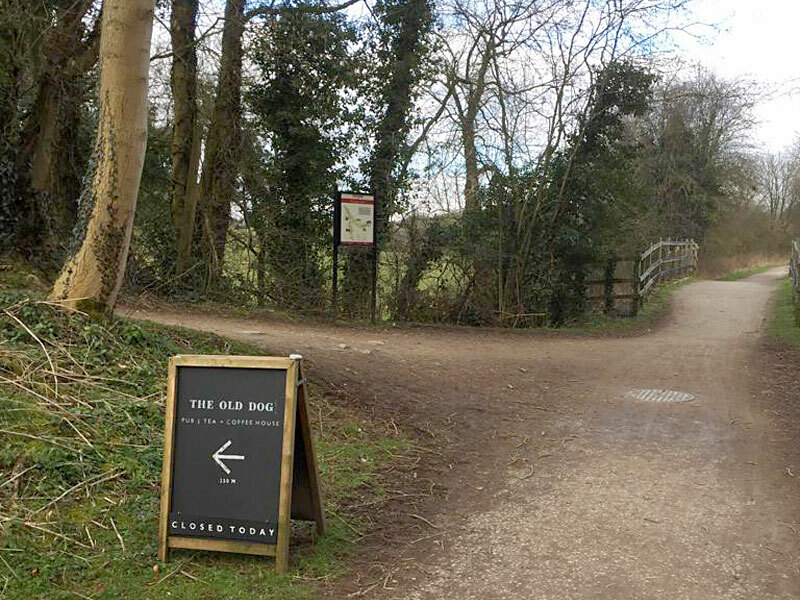 Starting and ending very close to The Old Dog pub for refreshments. 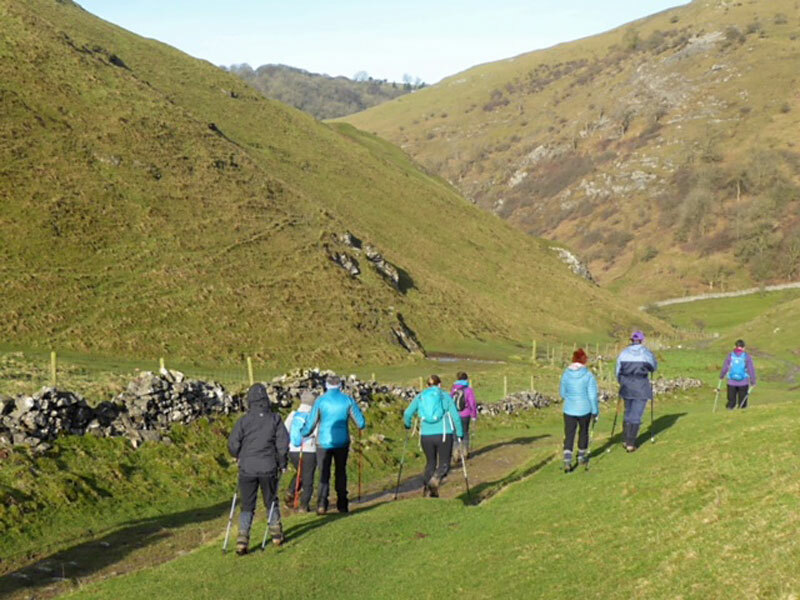 This walk takes in the beauties of one of the many faces of Dovedale, before climbing out by way of a tributary and as far as the upland village of Biggin. 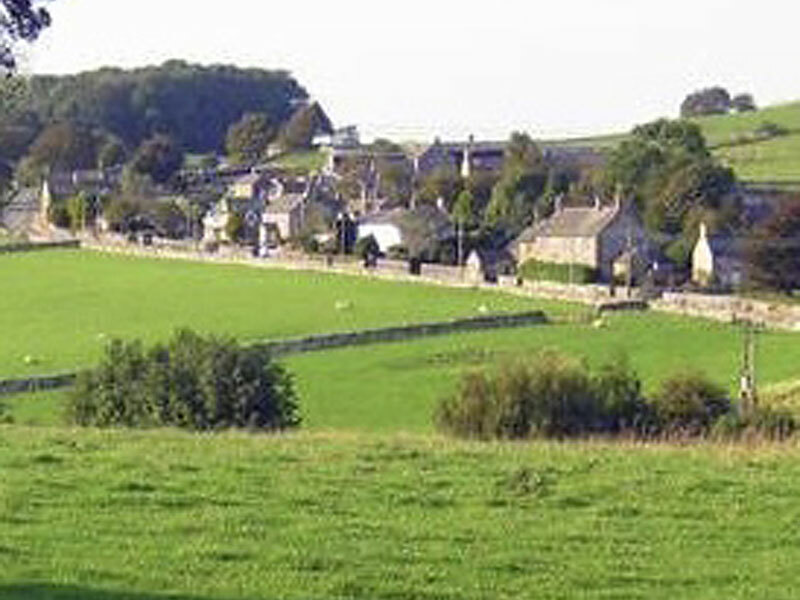 The village sits on the limestone plateau of the White Peak, one of those places that seem to be cut off from the frequently busy more popular tourist villages. There are no gift shops but just one welcoming friendly pub, the Waterloo, where it is easy to imagine some war weary soldier taking on the first licence after serving with the illustrious Duke of Wellington. At the end of the walk more refreshments are at The Newton House Hotel. Dovedale is a glorious medley of soaring limestone pinnacles, secret caves and natural arches, making it one of the most popular destinations in the Peak District. On this walk we’ll find out what makes the river so regal, how this rocky wonderland was created, and how it became an inspiration for Romantic poets and painters. 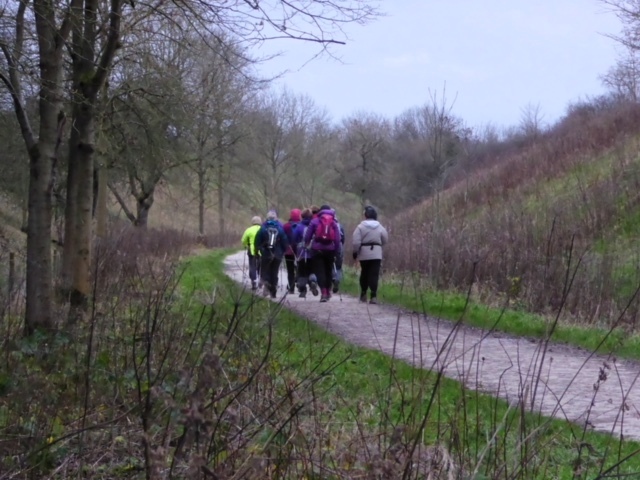 A delightful Wellbeing walk for those who have concerns about distance and terrain. 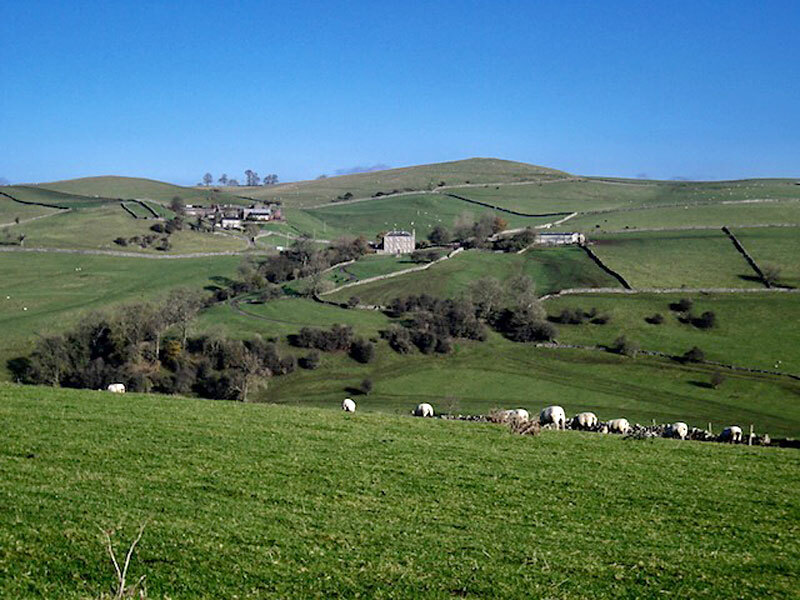 This walk will take you through the village of Tissington admiring all it has to offer and along a short section of the Tissington Trail. Walking through the village of Tissington, stopping to look a the Hall, the Wells, the pretty cottages some of the delightful shops that you can return to later. Passing the Sweet Shop emporium you’ll walk along a very quiet lane called High Flats, from here you’ll start to see some lovley views of the valley ahead. Arriving at a bridge from the old railway track take a moment here for pictures of the views ahead of you. A gentle path takes you down onto the trial for the rest of the walk before arriving back at the Trail Car Park and then back to the village of Tissington.